When the knee is bent or straightened, the kneecap glides in a groove, the trochlea. If the kneecap is forced out of the groove (=dislocation) we call it a kneecap dislocation. This may occur ‘spontaneously’ as a result of a wrong rotating movement or following a trauma in which the kneecap receives a direct blow. If it happens spontaneously, there is usually an underlying defect that means the kneecap can easily luxate (dislocate) from the groove. There are many possible causes: a shallow groove, the position of the kneecap being too high, insufficient muscle power or non-optimal ratio thereof, knock-knee or a growth disorder affecting the hip, etc. The underlying cause is always investigated during the consultation. A number of additional tests are usually necessary to do so. Based on this information a tailored treatment plan is compiled, specifically for the patient. An intensive exercise programme including physiotherapy is an indispensable component. 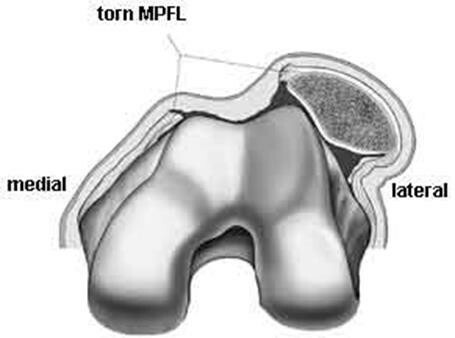 The medial patellofemoral ligament (MPFL) always tears during a kneecap dislocation. This ligament will not heal by itself, which means there is a significantly increased risk that the kneecap will dislocate again. In recent years, the surgical approach to patella dislocations has focused on reconstructing the MPFL, achieving excellent results. Therefore, following a second dislocation the decision is almost always taken to repair this ligament. In specific cases it may be decided to repair the ligament after the first dislocation. Depending on whether there are any underlying defects this procedure may be combined with other corrections. This is examined on a case by case basis. Bursitis is inflammation of the bursae. The knee contains a number of bursae. They ensure that the knee tendon and kneecap are able to slide effortlessly in relation to the surrounding tissue and skin when the knee bends and straightens. However, when a bursa is irritated it may become inflamed with localised swelling and feel hot. This is common among professionals in certain occupations that involve them frequently kneeling down (floor installers, plumbers). This is usually a condition that heals by itself. Prevention is more important. An inflamed, fluid-filled bursa can easily become infected. If a wound is visible on the skin, or the knee feels warm and appears red, or a fever develops, there may also be infection present due to bacteria, as well as inflammation. If there is infection, the bursa sometimes has to be rinsed and a course of antibiotics is administered. Tendinitis means inflammation of the tendon. There are several tendons around the knee that are more or less sensitive to strain. Typical complaints are a dull, nagging pain that flares up during or after an activity or sport. Inflammation occurs when a tendon is strained. Either the tendon is not strong enough for the load, or the strain is simply too great. Treatment in the acute phase consists of reducing the inflammation, with local treatment by a physiotherapist. In the second phase exercise therapy is used to strengthen the tendon. Underlying causes of recurring tendon inflammation are also investigated: axial misalignment, posture issues, rheumatism, etc. Tendon inflammation is common in certain sports, usually endurance sports. Iliotibial band syndrome (ITBS) is an inflammation of the tensor fascia lata ligament band. Repetitive bending and straightening of the knee causes irritation on the outer side of the knee. We often observe this in long distance runners and cyclists. Adjusting the position of the pedal can help relieve the inflammation. Knee tendon inflammation or jumper’s knee is another common condition. It is common in sports involving jumping such as basketball and volleyball. As well as in football when warming up at the beginning of a game: a sudden intense strain on insufficiently warmed up tendons, on hard fields.